Recipes, homeschool tips and life From my Blessed Lane to yours! I had a pretty good, no, make that great, little shopping trip today. Look what I got at Winn Dixie today for a total of........drum roll please..................99 cents!! Yes, I know, there is alot of not too healthy items in this pic, like the cookiesl and Pop Tarts, but a Pop Tart now and then for dessert never hurt anyone. And the cookies go in hubby's lunch box for work. Did I mention he is a sugarholic? Winn-Dixie has a special buy 3 select Kellog's cereal and you get a gallon of milk, WD brand O.J., 12 count PopTarts, and ready cooked bacon for free. 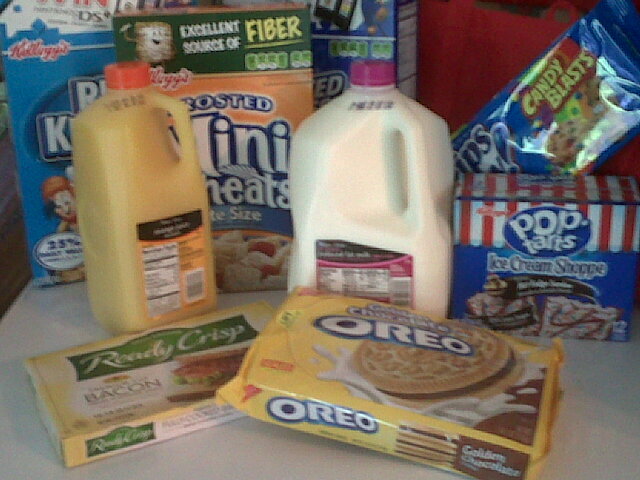 So I used 3 free coupons that Kelloggs sent me from the recent cereal recall, so everything was free! I also had the coupon from the Oreo Facebook promotion, buy 1 nabisco cookie and a gallon of milk and get 1 Nabisco cookie for free. So I used that coupon along with a $1.50 Oreo coupon. I used the self checkout lane and the cashier there was soooo helpful. He even let me do the deal twice in a row. I will so be on the lookout for him next time. I am a stay at home mom, nursing student, and a homeschool mom. Copyright 2009 Life in the Blessed Lane.